The film I’m taking a look at today is Broken Arrow from 1996, not to be confused with the James Stewart film of the same name. This one stars John Travolta and Christian Slater and is an all action affair. It’s been out for many years on Blu-ray but I thought it was high time I give it a look. So without further ado here’s my Broken Arrow (1996) Blu-ray Review. A USAF Major decides to hijack a stealth plane carrying two nuclear bombs with which he plans to force the US government into paying a massive ransom. The film is directed by John Woo with the cinematography handled by Peter Levy. Being an action movie there is certainly plenty of action sequences, thankfully the film is directed by John Woo who knows a thing or two about making them. A few of his American director credits include Mission: Impossible 2 and Face/Off. The action is well shot and choreographed and the end result is a very pleasing action movie that is thoroughly entertaining from start to end. The music is provided by Hans Zimmer and it’s a pretty awesome score and one perfectly suited to the action genre. It’s a score that you will remember long after the film has finished but in a good way. 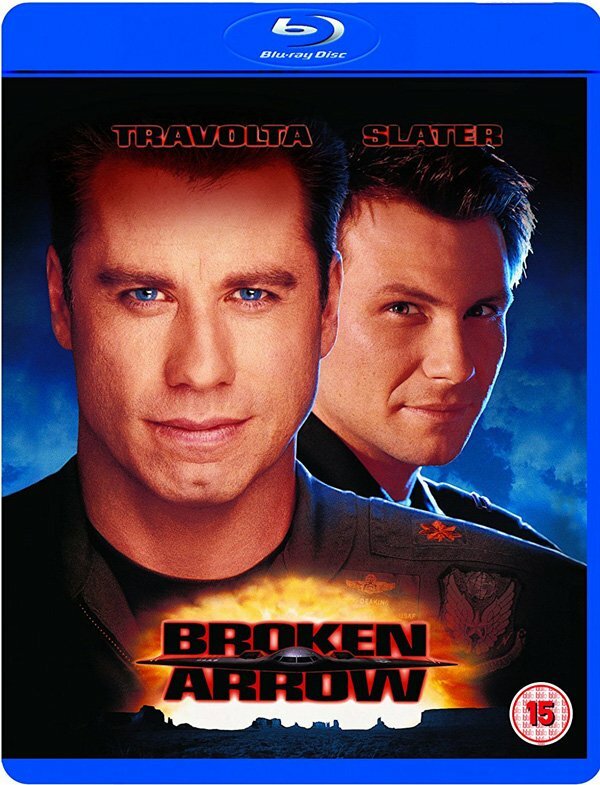 Broken Arrow revolves around three main characters, two of which are stealth bomber pilots that are responsible for the planes nuclear payload, USAF Major Vick Deakins played by John Travolta and Captain Riley Hale played by Christian Slater. Their relationship is at the heart of the film and is a very tense but thoroughly gripping and enthralling one. In Broken Arrow we get to see John Travolta play a character with a nasty side plus one whom is slightly unstable and it’s a joy to see. He really is excellent and gives the film a much needed focal point. Christian Slater on the other hand is more your nice guy wannabe hero type and to be fair he does play the role pretty well but make no mistake its Travolta that keeps you thoroughly gripped. The other character is that of Park Ranger Terry Carmichael played by Samantha Mathis. She finds herself caught up in the situation following the crash of the plane in the park territory. Whilst she is mainly there to provide some sexual chemistry between her and Christian Slater’s character she also proves she can more than look after herself against some so called highly trained ex-military personnel. Her performance overall is a good one and it does also help with the enjoyment of the story. If you are looking for a highly entertaining action movie than Broken Arrow is definitely one you should consider. John Travolta puts in an good acting performance that helps to elevate this action movie from good to very good. And for those wondering what the title Broken Arrow refers to it is apparently the term used by the US military when they lose control of their nuclear weapons. The films from 1996 but thankfully the picture quality is excellent. I mean I have zero complaints on that front, the image is sharp and clear whilst the colours are nice and vibrant. The only negative are on the extras front where there’s just a film trailer. Whilst it would have been nice to have a few interviews and such my main concern will always be on picture quality first, extras second on the list of priorities which some companies clearly manage to get the wrong way around but not here at least. Broken Arrow has been available on Blu-ray for several years and can be picked up for well under £10 and I highly recommend doing so. Broken Arrow (1996) is available now on Blu-ray. Travolta is simply outstanding in this highly entertaining action movie.